The captain ensures that the ship complies with local and international laws and complies also with company and flag state policies. 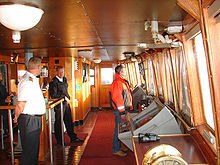 The captain is ultimately responsible, under the law, for aspects of operation such as the safe navigation of the ship, its cleanliness and seaworthiness, safe handling of all cargo, management of all personnel, inventory of ship's cash and stores, and maintaining the ship's certificates and documentation. On international voyages, the captain is responsible for satisfying requirements of the local immigration and customs officials. Immigration issues can include situations such as embarking and disembarking passengers, handling crew members who desert the ship, making crew changes in port, and making accommodations for foreign crew members. Customs requirements can include the master providing a cargo declaration, a ship's stores declaration, a declaration of crew members' personal effects, crew lists and passenger lists. The captain has special responsibilities when the ship or its cargo are damaged, when the ship causes damage to other vessels or facilities. The master acts as a liaison to local investigators and is responsible for providing complete and accurate logbooks, reports, statements and evidence to document an incident. Specific examples of the ship causing external damage include collisions with other ships or with fixed objects, grounding the vessel, and dragging anchor. Some common causes of cargo damage include heavy weather, water damage, pilferage, and damage caused during loading/unloading by the stevedores. All persons on board including public authorities, crew, and passengers are under the captain's authority and are his or her ultimate responsibility, particularly during navigation. In the case of injury or death of a crew member or passenger, the master is responsible to address any medical issues affecting the passengers and crew by providing medical care as possible, cooperating with shore-side medical personnel, and, if necessary, evacuating those who need more assistance than can be provided on board the ship. There is a common belief that ship captains have historically been, and currently are, able to perform marriages. This depends on the country of registry, however most do not permit performance of a marriage by the master of a ship at sea. In the United States Navy, a captain’s powers are defined by its 1913 Code of Regulations, specifically stating: "The commanding officer shall not perform a marriage ceremony on board his ship or aircraft. He shall not permit a marriage ceremony to be performed on board when the ship or aircraft is outside the territory of the United States." However, there may be exceptions "in accordance with local laws and the laws of the state, territory, or district in which the parties are domiciled" and "in the presence of a diplomatic or consular official of the United States, who has consented to issue the certificates and make the returns required by the consular regulations." Furthermore, in the United States, there have been a few contradictory legal precedents: courts did not recognize a shipboard marriage in California's 1898 Norman v. Norman but did in New York's 1929 Fisher v. Fisher (notwithstanding the absence of municipal laws so carried) and in 1933's Johnson v. Baker, an Oregon court ordered the payment of death benefits to a widow because she had established that her marriage at sea was lawful. 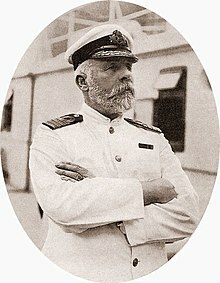 However, in Fisher v. Fisher the involvement of the ship's captain was irrelevant to the outcome. New Jersey's 1919 Bolmer v. Edsall said a shipboard marriage ceremony is governed by the laws of the nation where ownership of the vessel lies. In the United Kingdom, the captain of a merchant ship has never been permitted to perform marriages, although from 1854 any which took place had to be reported in the ship's log. Filipino and Spanish law, as narrow exceptions, recognise a marriage in articulo mortis (on the point of death) solemnized by the captain of a ship or chief of an aeroplane during a voyage, or by the commanding officer of a military unit. Japan allows ship captains to perform a marriage ceremony at sea, but only for Japanese citizens. Malta and Bermuda permit captains of ships registered in their jurisdictions to perform marriages at sea. Princess Cruises, whose ships are registered in Bermuda, has used this as a selling point for their cruises, while Cunard moved the registration of its ships Queen Mary 2, Queen Victoria and Queen Elizabeth from Southampton to Bermuda in 2011 to allow marriages to be conducted on their ships. Some captains obtain other credentials (such as ordination as ministers of religion or accreditation as notaries public), which allow them to perform marriages in some jurisdictions where they would otherwise not be permitted to do so. Another possibility is a wedding on a ship in port, under the authority of an official from that port. In works of fiction, ship captains have performed marriages in various media, including the 1951 film The African Queen, and episodes of The Love Boat, How I Met Your Mother, The Office (U.S. TV series) and various Star Trek series. As of 2013, captains of U.S.-flagged deep sea vessels make up to US$1,500 per day, or US$80,000 to US$300,000 per year. Captains of smaller vessels in the inland and coastal trade earn between US$350 and US$700 per day, or US$65,000 to $180,000 per year. Captains of large ferries average US$56,794 annually. Uniforms are worn aboard many ships, or aboard any vessels of traditional and organized navigation companies, and are required by company regulation on passenger and cruise vessels. In the passenger-carrying trade a unified corporate image is often desired and it is useful for those unfamiliar with the vessel to be able to identify members of the crew and their function. Some companies and some countries use an executive curl similar to that of the Royal Navy. In a few countries, such as UK, USA and Italy, some captains with particular experience in navigation and command at sea, may be named commodore or senior captain or shipmaster senior grade. The term master is descended from the Latin magister navis, used during the imperial Roman age to designate the nobleman (patrician) who was in ultimate authority on board a vessel. The magister navis had the right to wear the laurus or corona laurèa and the corona navalis. Carrying on this tradition, the modern-day shipmaster of some nations wears golden laurel leaves or golden oak leaves on the visor of his cap. A skipper is a person who has command of a boat or watercraft or tug, more or less equivalent to "captain in charge aboard ship." At sea, or upon lakes and rivers, the skipper as shipmaster or captain has command over the whole crew. The skipper may or may not be the owner of the boat. ^ a b Aragon and Messner, 2001, p.3. ^ Aragon and Messner, 2001, p.4. ^ Aragon and Messner, 2001, p.5. ^ Aragon and Messner, 2001, p.7. ^ Aragon and Messner, 2001, p.7-11. ^ Aragon and Messner, 2001, p.11-12. ^ Aragon and Messner, 2001, p.13-15. ^ Aragon and Messner, 2001, p.97. ^ a b Aragon and Messner, 2001, p.100-101. ^ Aragon and Messner, 2001, p.103-111. ^ Aragon and Messner, 2001, p.110-114. ^ Aragon and Messner, 2001, p.209. ^ Aragon and Messner, 2001, p.210-211. ^ Aragon and Messner, 2001, p.211-223. ^ Aragon and Messner, 2001, p.223-225. ^ Aragon and Messner, 2001, p.175-208. ^ Aragon and Messner, 2001, p.208. ^ Aragon and Messner, 2001, p.206-207. ^ Aragon and Messner, 2001, p.207. ^ Aragon and Messner, 2001, p.204, 206, 208. ^ Aragon and Messner, 2001, p.183-187. ^ Aragon and Messner, 2001, p.46-47. ^ Aragon and Messner, 2001, p.47-49. ^ Aragon and Messner, 2001, p.52-61. ^ Aragon and Messner, 2001, p.65-69. ^ Aragon and Messner, 2001, p.77-89. ^ Anthony Dickey, "Family Law: Marriage on the High Seas" in Australian Law Journal, Volume 62, p 717. ^ "Looking for records of a birth, marriage or death at sea or abroad". UK National Archives. ^ BT 334/117, Register of marriages at sea (1854-1972), UK Board of Trade, archived at The National Archives, Kew lists 219 marriages recorded in ship's logbooks, most performed at sea by chaplains or ministers of religion; their legal status nonetheless remains uncertain. ^ "G.R. No. 158298". Supreme Court of the Philippines. ^ "Código Civil: Libro I: Título IV". civil.udg.es. Retrieved 2017-02-12. ^ "British couples could soon marry on Cunard cruise liners crossing the Atlantic". Daily Mail (UK). ^ "Princess Cruises' Nautical Nuptials Offer Romantic Start to a Life Together : Princess Cruises". www.princess.com. ^ "Cunard Says 'I Do' To Weddings, Bermuda". Bernews.com. ^ a b "A Marriage at Sea? Get Me Rewrite". The New York Times. 2 March 2014. ^ "U.S. Code of Federal Regulations, Title 46, Part 10, Subpart 407". Archived from the original on 2007-09-30. ^ "Chief Mate Master Training". ^ "Charter Boats". Lni.wa.gov. Retrieved 2016-04-17. ^ a b Learning and Skills Council, 2008. ^ a b c Pelletier, 2007, p.160. ^ a b c Pelletier, 2007, p.45. ^ a b Bureau of Labor Statistics, 2008-2009, p. 4. Commonwealth of Australia (2008). "Ship's Master". Job Guide. Archived from the original on 2009-01-08. Retrieved 2009-03-01. Learning and Skills Council (2005). 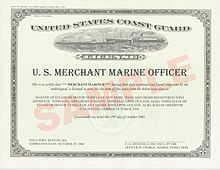 "Merchant Navy Deck Officer Job Profile". Careers Advice Website. London: United Kingdom. Archived from the original on 2008-09-17. Retrieved 2008-10-21.